B.E.C.M.I. is the abbreviated term for Basic, Expert, Companion, Master, and Immortal box sets. 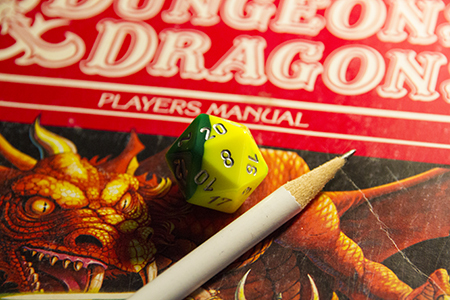 “Basic Dungeons and Dragons” was released in the USA in 1983. There were two versions prior to this known commonly as “Holmes edition” and “Moldvay edition”. They were all intended as a gateway into the existing Advanced Dungeons and Dragons systems that intimidated some players with more complex rules and tables. The revision author of the red box was Frank Mentzer with art from Jeff Easley and Larry Elmore. Plenty of people, that’s who. North Texas RPG con is one example of cons focused primarily on the older versions of tabletop RPGs. Many gamers, myself included, came to Dungeons and Dragon through this box set. The original box set is a little difficult to find these days, but the books still exist and have even been re-released by WOTC in PDF. Labyrinth Lord is considered the OSR standard version of the game. Some differences exist, but the feel and primary fun are all in place. Let’s take the controversy of an author out of this post and look at why it’s good to keep the old red box on your shelf. BECMI Dungeons and Dragons remains a quality product if we set all other things aside. It’s easy to pick up and play, limitless in possibility, and streamlined. It places story telling in the forefront and maintains a fast battle resolution system and extremely fun game that relies heavily on DM rulings to resolve issues. The red set (Basic) gives you just enough to play and run games up to level 3. It doesn’t concern itself with powers, ability or spells beyond that. The product itself is elegant and hard to put down as a read. If it doesn’t excite the gamer in you, you aren’t alive. For young gamers, it’s a wonderful introduction. The text and wording are carefully chosen to inspire the imagination and feed adventure. Just flipping through the pages, I find myself inspired to get moving on our next project. Isn’t it too simple for experienced gamers? If you came into the hobby during AD&D 2.0 – 5.0 it’s worth the read through and at least a night of trying it out. It isn’t really the same game and has a different flavor. It allows to DM to be loose and free with ideas and rulings. It’s almost like gesture drawing in the gaming world. In as little as 20 – 20 minutes you will have the gist of how to play and DM. The cap is put tightly on power while party collaboration takes over. Yes, races as classes. This was done to simplify the process and the game. Labyrinth Lord keeps this, and I believe the Rules Cyclopedia does as well. It’s worth at least a few play-throughs with the rules set as written before you begin house-ruling changes about race – class. 0D&D treated things a little differently. The red box deserves a play based on its own merits alone before you discard it based on anything else. The game is remarkably fun and exciting, even the solo adventure in the players manual. Once you get your BECMI group into the realm of levels 5-8 things really come into their own and become more exciting than should be allowed with one-page character sheets. The game is simply, fun as hell. To put a point on it, we are releasing our next adventure module from Fail Squad Games in BECMI and 5E. It’s worth while to keep it alive and keep the old school dice rolling. ← How do you deal with level 1? Hi Lloyd. Great post as always. I love the way you can take something that’s been written about ad infinitim and boil it down to why you should play Red Box. Bravo. Now a couple of things: The RC doesn’t address separate Race and Class and is strictly Race AS Class. Slo, Labyrinth Lord is also strictly Race as Class IF you’re just using the core LL rules. If you want to do separate Race and Class they break it down in the Advanced Edition Companion (a book I highly recommend using with core LL – in Matt’s games we’ve used BOTH and had a great time). Oivey. I forgot LL kept that. I will edit. It was earlier boxes tart separated them. Red Box is the edition I played first at the tender age of 11, and it’s the edition I used to to teach my son and goddaughters D&D, though they have since tinkered with other games and other editions. I heartily agree with your assertion that Red Box was and remains a superlative entry point to D&D, and that the BECMI edition as a whole can be all a gamer ever needs for decades of gaming fun. Hi, in Italy the Red Box was the first D&D edition ever arrived,the one which made a lot of people start to play, it’s still very beloved and very used by tons of players in Italy. Frank Mentzer told me that when he came to visit a convention in Italy, most folks thought he was the creator of D&D because of the red box.